SRC briquettes are easy to handle and apply in the field using filter socks for 2-in. and 4-in. wells or by direct application to wells. SRC  in liquid form! Granular powder is mixed into an injectable solution for more aggressive early-stage bioremediation. SRC-7 is a patented technology comprised of a blend of carbohydrates and biopolymer substrates of varying molecular weights and solubilities. SRC-7 is applied as solid briquettes which are poured directly into PVC treatment wells/points by gravity from the bottom up to within a few feet of the water table. SRC-7 socks are installed immediately below and/or across the water table to target treatment of water-table smear zone and "vapor halo" CVOCs. SRC-7 socks also consume oxygen and minimize DO near the water table to optimize treatment conditions. SRC-7 socks can also be used for in-well treatment and monitoring. 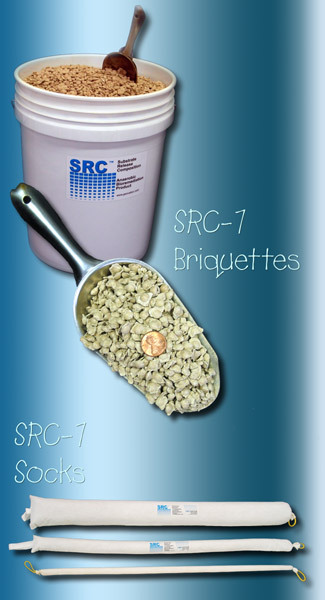 SRC-7 briquettes disintegrate and hydrate to form a dense and concentrated substrate/nutrient slurry which promotes a relatively rapid diffusive flux and density-driven dispersion of substrates into and through aquifer media (which mimics the migration of DNAPL contaminants). SRC-7 is an effective means of treating DNAPL source areas and high levels of sorbed-phase CVOCs. 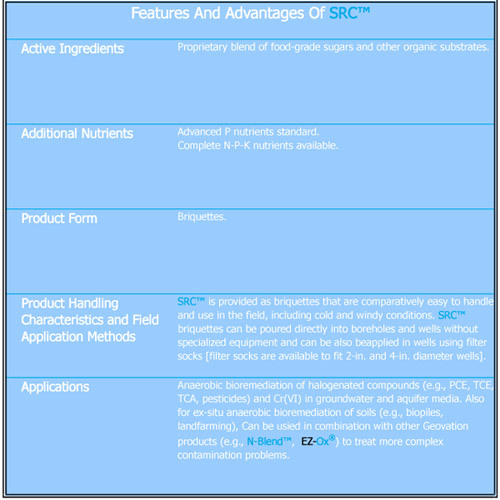 SRC-7 is a blend of substrates (not a single compound) that stimulates robust microbial growth and diverse consortia of anaerobic microorganisms including Archaea, Bacteria, and Fungi. Microbial diversity provides a wider array of catabolic processes and metabolic functions to create a sustainable microbial ecosystem that avoids "stalled" bioremediation. Both reductive dechlorination and anaerobic oxidation processes act to degrade both parent and daughter compounds. SRC-7 technology provides cost-effective means for the long term treatment of CVOC source areas, semi-passive bioremediation programs and "maintainable" anaerobic barriers. Source-area bioremediation for chlorinated solvents is complicated by the complex migration of DNAPLs and the high proportion of sorbed-phase contaminant mass in the aquifer media compared to the relatively minor CVOC mass in ground water. Desorption of aquifer bound CVOCs is typically the rate-limiting factor for source-area remediation, such that effective bioremediation may be properly viewed as a long-term process. Experience has shown that repeated injections of "commodity" substrates and slow-release electron donor materials is typically required to achieve meaningful reductions of CVOCs in source areas. Aggressive and one-shot commodity substrate and slow-release donor injections often succeed initially, only to see progress wane or stall as pH levels become progressively more acidic. The mechanisms of this phenomenon, while still uncertain, are likely attributable to overly aggressive rates of carbon addition, declining microbial diversity, and loss of metabolic function. Geovation's SRC (Substrate-Release Composition) technology is different than either commodity substrate injection or injection of slow-release materials. SRC combines some of the benefits of both while avoiding overly acidic treatment conditions that lead to microbial inhibition and stalled bioremediation. SRC seeks long-term process optimization through promoting and maintaining more moderate pH and stable low-Eh treatment conditions. Diverse consortia of bacteria, archaea, and fungi develop a sustainable microbial ecosystem that works to desorb and degrade aquifer-bound CVOCs. SRC technology is specifically designed for long-term, low-cost bioremediation. Click on the scoop to download the brochure!